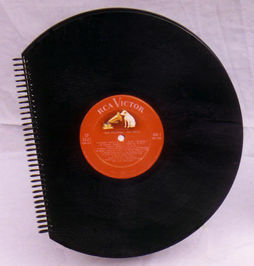 A visual pun, these blank books are made from real 33-1/3 LP records. Each is spiral bound with approximately 60 sheets of quality unlined pastel writing stock color coordinated with the record label (for journaling, sketching, or use as a unique guest book) or approximately 30 sheets of black, acid free stock (suitable for mounting photos). While we cannot meet requests for specific artists, you may specify your preference of musical style. Inspiration, information and affirmation for immediate use. Filled with art and writing techniques, exercises, ideas, templates, and an extra packet of supplies to help you personalize this workbook. A great gift for yourself or a friend. 8-1/2" x 11" spiral bound, 100 pages, soft cover. Illustrated throughout with black and white drawings and 4 full color reproductions. Packet of miscellaneous art supplies includes stickers and 5 templates. Cardboard covers bound with sturdy embroidery floss in random colors. Fifty unlined matching tan-tone sheets of tough stock suitable for cutting, folding, collage, pen and ink writing and drawing, acrylic application, colored pencils, oil pastels and water media. Takes gesso beautifully. These journals travel well, hold up under stress, and are real work horses. At this price, you'll want to buy more than one and enjoy the freedom to experiment! Hand bound in our studio. Terrific travel companions, these water brushes save you the trouble of transporting clumsy water bottles. Each has an empty barrel you can easily fill with water, colored ink, dye, or diluted paints. Easily cleaned and ready to use. Mine hasn't leaked on the airplane! Great for artful journaling or sketchbooking at home or on the road. Choose from 4 different sizes or save money and get the whole set. Imported.